1. To add, edit or remove a teacher click the Admin icon and select 'Teachers'. 2. Then either click the 'Add' button or select a teacher and click 'Edit' or 'Delete'. 3. If you click Add or Edit then a teacher properties window will appear which will allow you to add or edit the teacher information. 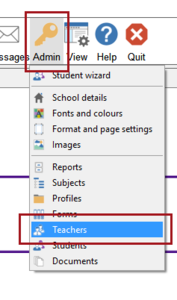 In the 'Full Name' box enter the teachers name as you would like it to appear in the report. In the username box enter the username you would like the teacher to have (once a username has been created it cannot be changed). In the password box enter the password you would like the teacher to use - repeat the same password in the verify box. There is a handy 'generate password' button to make a password that is easy to remember. If the teacher would like their name on the report front cover then pick their form in the Form drop down menu. If not then leave this as '- - -'. In the access box enter * if the teacher can access every form. Or you can enter the name(s) of other forms they need access to. Leave it blank if they just need to access the form in the form drop down menu. Click 'ok' to add or finish editing the teacher. This page was last modified on 9 May 2017, at 07:46.